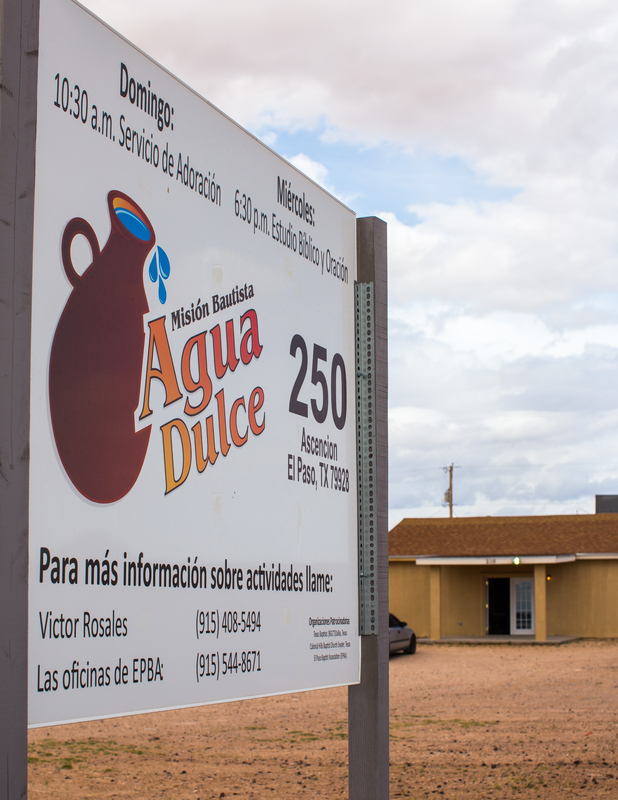 Many people who live in Agua Dulce, a small community in the southeast region of El Paso, have limited access to food and medical care. A large percentage of the community consists of undocumented immigrants and many families do not have fathers and husbands to provide for basic needs. Texas Baptists River Ministry Coordinator Jesus Galarza has worked around Agua Dulce for several years and has built trust with the residents in order to help meet basic needs. This spring, Galarza coordinated a medical mission trip with students and physicians from UT-Southwestern Medical Center Baptist Student Ministry to provide medical clinics for children and adults. In conjunction with the medical clinics, Galarza also coordinated a feeding ministry for families at Agua Dulce Baptist Church. After undergoing basic health screenings, such as blood pressure and glucose testing, families were able to receive food to feed their families for up to a week. The food, provided by the Texas Baptist Hunger Offering, met immediate needs for many. While children receive food each week at school through government-funded programs, when they are on vacation from school, there is often no food at home for the family. Galarza met a single mother who was amazed at the services being offered and questioned why the services were free. He told her his fellow Christians wanted to bless her family with food and medical care. As she received her bags of groceries, she told Galarza she was very grateful and would take it home to feed her children with plans to share with her neighbors. 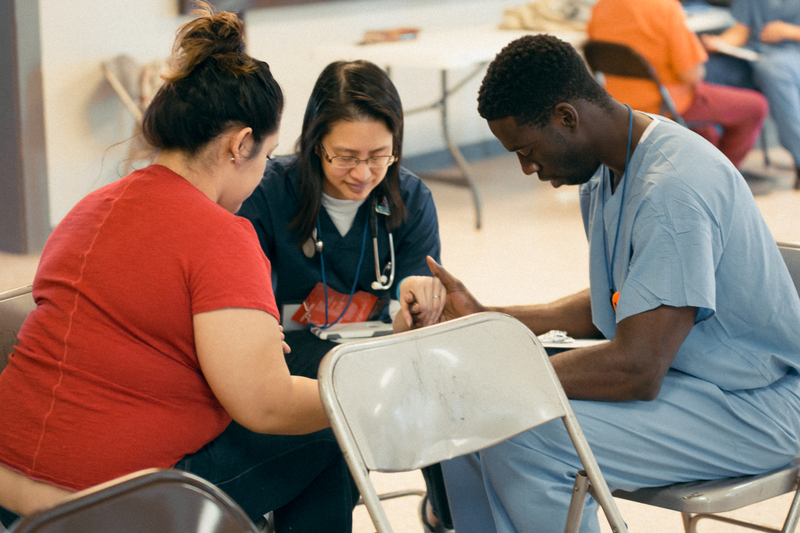 Stan Kwan, BSM Director for UT-Southwestern, led the team of 35 students and eight physicians who conducted 16 medical clinics around El Paso. Students were able to gain valuable experience with hands-on patient interaction and the use of medical Spanish. “We provided an opportunity to minister to patients medically, emotionally and spiritually, as well,” Kwan said. Kwan was encouraged as he watched students pray with patients and saw God move throughout the week as more than 50 people heard the Gospel. Each day a different physician shared their “God-story” with the team, which proved to be encouraging for the students. “All the students were definitely impacted by these testimonies - not only hearing them, but working side-by-side with these physicians and seeing them live out the Gospel,” Kwan said. The partnership between River Ministry, the Hunger Offering, and BSM students working together to serve underserved people in El Paso proved to be a fruitful week of ministry, according to Galarza. Texas Baptists are collecting a special 5th Sunday Hunger Offering on Sunday, April 30. Make a donation to help overcome the cycle of hunger and poverty experienced in Texas and around the world by visiting hungeroffering.org. You can also follow Texas Baptist Hunger Offering on Facebook, Twitter and Instagram.